After a very long line of Canon updates with nothing significant from Nikon, it's time to make amends, as Nikon launches the D600 full-frame D-SLR. 24.3-megapixel FX-format (full-frame) CMOS sensor with excellent signal-to-noise ratio and wide dynamic range. Delivers richly detailed images with smooth tonal gradations. Highly sensitive autofocus with Multi-CAM4800 39-point AF system: delivers fast and precise coverage across the frame. Sensitive down to -1 EV and compatible up to f/8. ISO 100–6400: extendable up to 25,600 (equivalent) and down to 50 (equivalent). Enables faster shutter speeds for finely detailed images with minimal noise. HDR (High Dynamic Range): ideal for high-contrast scenes. Takes two shots within a single shutter release to create an image with an extremely wide dynamic range, low noise and rich color gradation. Active D-Lighting: capture more detail in high-contrast lighting conditions. Nikon’s Active D-Lighting automatically retains the details in both dark and bright areas for stunning images with natural contrast. Scene Recognition System: the camera’s image sensor and its 2,016-pixel RGB sensor provide precise data to the Scene Recognition System, which optimizes exposure, autofocus and white balance immediately before the shutter is released for sharply defined images. Time-lapse shooting: use Interval Timer Shooting to trigger the shutter at preset intervals. Use Time Lapse Photography to save images as movie files and view slow action in fast playback, with playback rates from 24 to 36,000 times faster than normal. Picture Controls customize the look of your stills and videos by fine-tuning parameters such as sharpness, saturation, and hue before capture. Precision 8-cm (3.2-in. ), 921k-dot, VGA LCD monitor with automatic monitor brightness control. Delivers bright, crisp image playback with a wide color reproduction capacity. 5.5 fps continuous shooting: capture fast-moving action at five-and-a-half frames per second. Mirror balancer: minimizes the bounce of the mirror’s down movement, extending viewing time and allowing more time for AF operation—one reason the D600 achieves AF and focus tracking even during high-speed continuous shooting. Compact, light and durable: built to withstand severe conditions, the camera boasts magnesium alloy top and rear covers and weighs only 760 g (without battery). 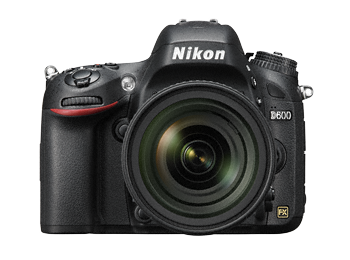 Weather-sealed to the same degree as Nikon’s professional D800 SLR, it offers enhanced resistance to moisture and dust. Dual-axis electronic virtual horizon: you can confirm the camera's position relative to the horizontal plane and its pitch (forward or rear rotation) using the LCD monitor, or the viewfinder.